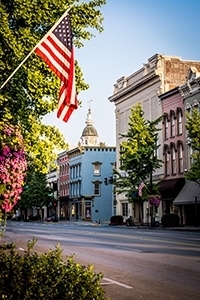 Danville is a small southern town rich in history and charm, located in the heart of the Bluegrass Region of central Kentucky. Though small in size, our community is close-knit and vibrant, with a colorful historic downtown district replete with locally owned shops, restaurants and businesses. Danville is noted as being the birthplace of Kentucky, while nearby Perryville, also in Boyle County, is noted as the site of the bloodiest Civil War battle in the state. Throughout the year, our county holds numerous festivals celebrating brass band music, barbecue, and Civil War history, to name a few. Our town is home to the site of the signing of the Kentucky constitution, the pioneering abdominal surgeon Dr. Ephraim McDowell, and Kentucky's largest Civil War battle, among others. Aside from being steeped in history, we are also home to a vibrant and flourishing arts community, complete with performing arts venues, theaters, art galleries, downtown gallery hops, and a profusion of local artists and arts events. Our county is also the perfect getaway with its scenic back roads, rolling hills, and abundant wildlife--enjoy a day at one of our city parks or take a hike at our wildlife refuge. Our ever-growing network of bike lanes and mixed-use trails speaks to the active, healthy lifestyle of many of our residents. We are also home to Ephraim McDowell Regional Medical Center and a wealth of other top-notch healthcare providers. All this and more make Danville a safe, affordable, fun place to start your next adventure! Includes Cities/Towns: Danville, Parksville, Perryville. Lake Herrington is perfect for boating, fishing, canoeing, and kayaking, while our Millennium Park and Central Kentucky Wildlife Refuge offer places to walk, jog and hike. Bike lanes and back roads are open to cyclists, and there are local 5k runs almost every weekend in our area. A wealth of locally owned restaurants and businesses dot our historic downtown district for a fun weekend outing. Our numerous festivals throughout the year include a brass band festival, barbecue festival, and Civil War battle reenactment, to name a few. Our downtown district's nightlife is vibrant, with a multitude of bars and restaurants. Danville, Kentucky, was named one of just five cultural districts in the entire state, and for good reason--the Norton Center for the Arts hosts world-renowned performers from across the globe; the Community Arts Center is home to a wide array of rotating exhibits, classes, and special events; Pioneer Playhouse, Kentucky's oldest outdoor theatre, offers shows under the stars all summer long; West T. Hill Community Theatre has put local talent in the spotlight for over 35 years; the Boyle County Public Library contains an interactive children's area, local art displays, and a host of special educational and community events; the Great American Dollhouse Museum showcases the art of miniatures; McDowell House Museum preserves a milestone in American medical history as the home of Dr. Ephraim McDowell, the Father of Abdominal Surgery; and Constitution Square Park is the site of the signing of Kentucky's Constitution. This is just the tip of the iceberg of the cultural activities and amenities Danville has to offer! Limited service in and around town on the DAN-TRAN, as well as reduced-fare trips to neighboring cities of Louisville and Lexington. Danville and the surrounding region is served by Ephraim McDowell Regional Medical Center, a 222-bed hospital, and the Ephraim McDowell Health system featuring multiple wellness, treatment, and care facilities and more than 100 physicians practicing 40 medical specialties. A year in Danville, Kentucky, brings with it a variety of weather; our park-like city, with its abundance of mature trees and other foliage, puts on a fantastic show every spring and fall, and provides abundant shade throughout the summer months. During the winter, our tree-lined downtown is strung with festive lights that fill locals with holiday cheer. Average annual temperature in 2012 was 57.6 degrees. Normal precipitation (30-year record) is 45.17 inches. Mean annual snowfall (30-year record) is 13 inches. Total precipitation in 2012 was 42.62 inches. Prevailing winds are from the south. Relative humidity (30-year record, as of 1 p.m.) is 61 percent. Condos Over 50 Communities The median home price for Boyle County is $129,500 (2012). A variety of housing options are available to meet diverse tastes and needs, from historic homes to zero-lot patio homes to residential golf communities and independent and assisted living facilities. Home care Senior center Visiting nurses Danville has a variety of assistance available to seniors, from in-home services, to assisted living and senior centers, to reduced-cost transportation around Danville and to neighboring cities. As a premier retirement town, we take care of our retirees! Seniors can volunteer at a variety of places throughout Danville and Boyle County, including the Community Arts Center, West T. Hill Community Theater, the Heart of Danville, The Heart of Kentucky United Way, Heritage Hospice, Bluebird Market, Pioneer Playhouse, The Great American Brass Band Festival, The KY State BBQ Festival, Oktoberfest, and more! Whatever your interests, there is a way to get involved in Danville. Danville-Boyle County values the knowledge, experience, resources, and time of its retirees. We waste no time in getting you involved in our community, which is deeply enriched by the critical volunteer, advisory, and leadership roles that retirees have performed in service to others in their hometown of choice. For example, several retirees to the Danville area serve with distinction on the EDP's Partner boards of directors, such as the Chamber of Commerce, Convention & Visitors Bureau Heart of Danville, and Industrial Foundation.